They exist, but are under strict orders not to communicate with Earth. Rejoinder: In numerous vast ET civilizations, each presumably with billions of diverse individuals, it is hardly credible that a galactic society could impose a global ban on communication to Earth that is absolutely 100% effective. Once a signal has been sent to Earth, it cannot be called back, within known laws of physics. They exist, but have lost interest in scientific research, exploration and expansion. Rejoinder: Since Darwinian evolution strongly favors organisms that think, explore and expand, it is hardly credible that every individual in every ET civilization has lost interest in scientific research, exploration and expansion. They exist, but have no interest in a primitive, backward society such as ours. Rejoinder: Perhaps 99.99% of ETs are not interested in primitive societies such as ours, but, as before, it is hardly credible that every individual in every ET civilization has no interest. Perhaps 99.99% of humans have no interest in ants; but thousands do, and have carefully studied every known species. They exist, but have progressed to more sophisticated communication technologies. Rejoinder: This does not apply to signals that are specifically targeted to societies such as ours, in a form (optical, microwaves) that could be easily recognized by a newly technological society. Again, it is hardly credible that absolutely no individual, in any ET society, has attempted such communication with Earth. They exist, but are not aware of our existence yet, since radio and TV signals have not reached them. Rejoinder: Our atmosphere has contained methane, oxygen and other chemical signs of life for at least three billion years. Images of Earth would have shown dinosaurs and countless other large species for at least 300 million years, bipedal hominins for at least 5 million years, and humans for at least 200,000 years. Large human structures (Mesopotamia, Egypt, China, Rome) would have been visible for at least 5,000 years with urban lights for at least 2,000 years (particularly in the past 200 years). Finally, atmospheric carbon dioxide has been on the rise for at least 200 years. They exist, but travel and communication are too difficult. Rejoinder: Just in the past few years, we have made remarkable advances in numerous space-related technologies: novel energy sources, new propulsion systems, new space transportation vehicles, fleets of nanocraft and von Neumann probes (which could explore the entire Milky Way in a million years or so); supercomputers that can perform over 100 quadrillion operations per second; and the emerging fields of LIGO astronomy and gravitational lens astronomy, to name a few. If we are on the verge of deploying such technologies today, what is stopping societies and even individuals that are thousands or millions of years more advanced than us? Civilizations like us invariably self-destruct before becoming a space-faring society. Rejoinder: In 200 years of technological adolescence, we have not yet destroyed ourselves through a nuclear, environmental or biological catastrophe, and in fact researchers in the past few years have made significant advances in supercomputer simulations to foresee and help prevent such calamities. Thus it is hardly credible that every technological society invariably self-destructs before it becomes space-faring society, with no exceptions whatsoever. Besides, within 10-20 years we will have outposts on the Moon, Mars and elsewhere, so that human society will be largely impervious to calamities back on Earth. Earth is a unique planet with characteristics fostering a long-lived biological regime leading to intelligent life. 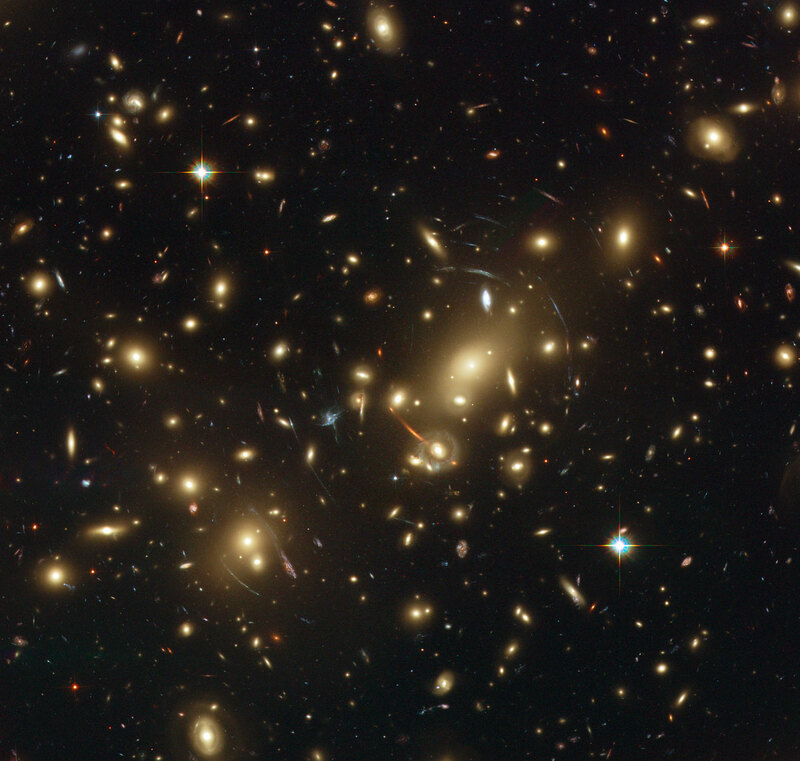 Rejoinder: Perhaps, although many discoveries in recent years point in the opposite direction: the universe is now known to contain 100+ billion galaxies; the Milky Way is now known to contain 100+ billion stars; and thousands of exoplanets have been found, with many in a “habitable zone” that may support life. L = length of time such civilizations release detectable signals into space. Researchers using this formula have obtained estimates as high as 100,000,000. But the authors of the new paper point out that the estimates that have been published to date for these parameters have been “point estimates,” i.e., single numbers, which do not correctly convey the substantial level of uncertainty that they entail. They observe, for instance, that the probability of the emergence of life can only be vaguely estimated at the present time, because although intriguing advances have been made (e.g., the “RNA world” scenario), researchers have not yet produced a fully-detailed path of how life arose on Earth. Other uncertainties surround key milestones such as the emergence of prokaryotes, the emergence of eukaryotes, the development of multicellular life, and the development of technology. Even setting aside these authors’ analysis, the proposed “solutions” that have been mentioned in the literature are not very convincing, to say the least — see above. Indeed, with every new discovery of extrasolar planets with a potential life-friendly environment, and, even more so, with every new advance of computer, communication and space technology, the “easy” answers to Fermi’s paradox recede further away. They are not here, because they do not exist. The reasons why we are here form a chain so improbable that the chance of any other technological civilization existing in the Milky Way Galaxy at the present time is vanishingly small. We are alone, and we had better get used to it. Yet most scientists still insist on the traditional view of a universe teeming with extraterrestrials. For example, noted physicist/cosmologist Lawrence Krauss recently opined in a PBS broadcast that there must be countless technological societies in the cosmos; the reason they have not yet reached out to Earth is simply that signals from our radio and TV transmissions have not yet reached them, so that they are unaware of our existence (i.e., solution #5 above; see rejoinder). Along this line, astrophysicist Adam Frank writes in his new book Light of the Stars: Alien Worlds and the Fate of the Earth that it is “highly likely” that many other planets are or have hosted technologically advanced civilizations, but that they have faced challenges such as climate change and might not have survived (i.e., solution #7 above; see rejoinder). The Copernican principle, or principle of mediocrity, as it is sometimes called, holds that there is nothing unusual or atypical about humanity — not our place on Earth (merely one of millions of biological species), not our place in the solar system (merely one of numerous planets and other objects orbiting the sun), not our place in the Milky Way (merely one of billions of similar star systems), and not our place in the larger universe (merely one of billions of similar galaxies). It implies that the universe must be teeming with intelligent, technological societies. But is the Copernican principle really such an infallible guide to truth? Does its presumed “beauty” (which is an aesthetic, not a scientific concept) really matter? Newtonian physics. Newton’s clockwork universe on an unchanging grid of space and time seemed just too natural and beautiful, and this mindset retarded acceptance of relativity and quantum mechanics for decades. Supersymmetry. Supersymmetry, the notion that each particle has a “superpartner,” was originally proposed in the 1970s, and more recently was proposed to explain why, for example, the Higgs boson has the mass it has. But no such superparticles have been found, even in the latest experiments on the Large Hadron Collider. Undeterred, many physicists just “know” it must be true. String theory. String theory has been proposed as the long-sought “theory of everything” uniting relativity and quantum theory, mostly because it is so “beautiful.” But in spite of decades of effort, by literally thousands of brilliant mathematical physicists, no experimentally testable prediction or test has been produced. What’s more, hopes that string theory would result in a single crisp physical theory, pinning down unique laws and unique values of the fundamental constants, have been dashed. Instead the theory admits a huge number of different options, by one reckoning 10500 in number. Multiverse. Attempts to explain the apparent fine tuning of the laws and constants of physics have led many physicists to propose a “multiverse,” namely a huge collection of other universes (see previous item, for instance), and to explain fine tuning by saying, in effect, that if our particular universe were not fine-tuned pretty much as we see it, we could not exist and thus would not be here to talk about it; end of story. But many other scientists consider this “anthropic principle” argument highly controversial, an abdication of empirically testable physics. Is this really the best explanation that the field can produce? As mentioned above, the Copernican principle suggests that human society is merely one of billions of intelligent, technological civilizations in the cosmos. Indeed, it is often considered naive and archaic to even consider that we might be special in any significant sense. And yet, the empirical data, namely the utter lack of any evidence to date of an extraterrestrial technological society, points in the other direction. As mentioned above, Gribbin concludes that we are alone within the Milky Way, and that “we had better get used to it,” suggesting that the notion of being alone within the Milky Way is an barely tolerable notion (although there may still be billions of such societies in the universe). But why is this such a barely tolerable notion? Simply because it goes against the Copernican principle? And why should we have such unbending faith in the Copernican principle as an infallible guide to truth? To the contrary, the emerging picture from the latest scientific data, namely that human existence is far more singular than anyone dreamed of even a few years ago, and, at the same time, that the universe is far vaster and more exotic than anyone dreamed of even a few years ago, is, in the present author’s view, an awe-inspiring vision, not a depressing one. It suggests a grand future for mankind as a sophisticated, space-faring society, as physicist Michio Kaku envisions in his new book The Future of Humanity: Terraforming Mars, Interstellar Travel, Immortality, and Our Destiny Beyond Earth (although, curiously, Kaku dismisses Fermi’s paradox, citing what amounts to solution #3 above; see rejoinder). One bright spot, mentioned above, is that rapidly advancing technology is dramatically increasing our ability to search for and study potentially habitable extrasolar planets that may house technological civilizations. One way or the other, we should have a significantly clearer view of these issues in the next ten years or so. We can all look forward to that day. [This also appeared in the Math Scholar blog].